Like St. Clement's in Saint Paul and Christ Church in Hibbing, St. Paul's Episcopal Church was the beneficiary of an East Coast donor, in this case the Cudlip family. Only the sanctuary of the building that exists today is Gilbert's work, and no photographic evidence of the church, as it was built, has been found. A large area of Virginia burned just after the church was built, and portions of the town have been relocated to allow for the expansion of an open-pit iron mine. Also, Gilbert's plan called for the building to be oriented 180 degrees from its present position. It is unclear whether the building was damaged, moved, or never fully built. The original plan called for a tall, tapered, shingle-covered tower and belfry, a multi-purpose guildhall/Sunday school that opened to the rear of the sanctuary with rolling partitions, and above that, an apartment. The integration of these elements is masterful, experimental, and charming. The existing tower and south facade, built about 1905, are not original. 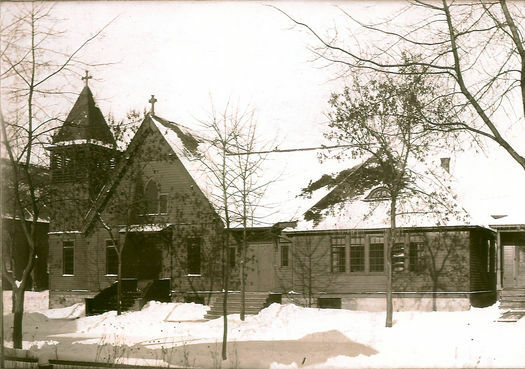 The design and detailing of the building relates to the Schurmeier House in Saint Paul (1883), the Seligman Carriage House in Helena, Montana (1887), the Virginia Street Church in Saint Paul (1886), the Camp Memorial Chapel in Minnetonka Beach (1888), and the German Bethlehem Presbyterian Church in Saint Paul (1890). Decorative elements include cottage windows, sawtooth cedar shingles, shingled gables and bargeboards, and shingles in diamond patterns. The interior of the sanctuary is preserved much as Gilbert designed it. It is built entirely of inexpensive factory-produced lumber including Stick-style two-by-eight trusses and beaded ceiling-boards. This little church presents one of the most puzzling mysteries to Gilbert scholars and enthusiasts: how is it that the sanctuary came to be built precisely to Gilbert's drawings, while the facade and tower on the church today are an entirely different design? Was the Gilbert design destroyed and the church rebuilt, or perhaps never fully built to his specifications? The Cass Gilbert Society would appreciate any information, especially any pre-1908 photographs. Please contact us with further scholarship on this church.